Advantages: Very readable text, effective integration of personal accounts, superb artwork, and excellent choice of photographs. 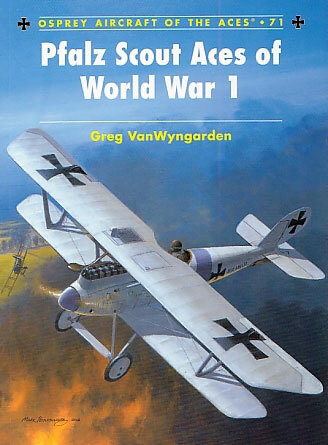 This popular series continues with a look at those men that flew Pfalz single seaters in World War I. Although the word “Aces” is mentioned in the title, this is a bit of a misnomer. As the author himself explains, it in not always possible to determine what type of aircraft a pilot was using to score a particular “victory”. By necessity, Jagdstaffeln operated aircraft from a mixture of manufacturers at certain times. So for this instalment of the Osprey series, there is a broadening of the definition of what constituted a “Pfalz ace”. This is not necessarily a bad thing. It gives the reader a chance to read about interesting experiences in these aircraft that would normally not rate a mention. One case in point being the clandestine raid by the Germans on Italian troops. As Germany hadn’t yet declared war on Italy, they painted their Pfalz parasols in the red and white strips of the Austro-Hungarian Luftfahrtruppe. Thus they could go on their bombing raid under the guise that their aircraft were Austrian! Another story that wouldn’t have come to light in other volumes involved Rudolph Stark. He was attacked by a French aircraft and had his machine peppered with bullets. With petrol leaking around his legs in the cockpit, he zigzagged back to the airfield, thinking he was being fired upon all the way home. Only when he landed did he realize that the ‘machine-gun” sound was being made by a shot-up shoulder strap banging on the fuselage while in the slipstream. The standard 96 pages of this series make for a very interesting read. The author’s writing style doesn’t bog the student down as can sometimes be the case with biographies. This is helped by the very effective use of personal accounts by the pilots themselves. These are interspersed throughout the book and provide an effective “atmosphere” for the reader. A very nice surprise is the selection of photographs chosen for this publication. There are over one hundred black and white images with many being new to all but the most hardened enthusiast. The captions are typical of this writer. They are well thought out, informative, and compliment the text very well. Harry Dempsey contributes with the artwork and does not disappoint. Thirty two profiles are portrayed with extra plan views where more detail is necessary. Many types are covered including the Parasol, monoplane, D.III/IIIa, D.VIII and D.XII. It’s pleasing to see some different schemes displayed and although based on logical assumptions, Greg admits that some will remain speculative; All excellent material for some healthy debate. The layout of the book is also impressive. After an introductory chapter on the monoplanes, the company’s D.III/D.IIIa fighter comes to the fore. Due to the sizable quantity produced, describing the aircraft/pilot relationship in this section could have become quite confusing. This doesn’t happen and the “Jasta by Jasta” approach allows a methodical journey through this section of the book. The less produced D.VIII and D.XII machines round out the text along with a selection of 1/72 general arrangement drawings. This is an excellent addition to the series on World War I Scout Aces. Although not strictly adhering to the title of the book, it is no less fascinating. The reader is given a chance to read about the adventures of some lesser known airmen whose tales are as captivating as their more famous companions. The high standards set by both author and illustrator continue and add much to educating the reader about the exploits of men in the infancy of aerial combat.